Now that school's out for summer and there aren't any more book things to do, I've found myself with all sorts of free time. I can read books and lounge around at parks and job search and sleep. Glorious sleep. And have fun in the kitchen again! If you've been following me on Instagram, you've seen the little experiments happening in real time. 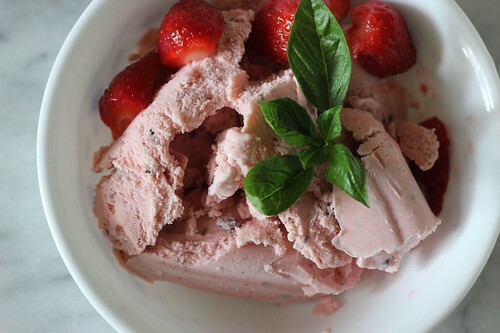 One such fun thing was making roasted strawberry rhubarb basil ice cream. See, I had bought two quarts of sweet strawberries from the Union Square Greenmarket, overlooking the price just this once. But my first experiment only used up one quart. 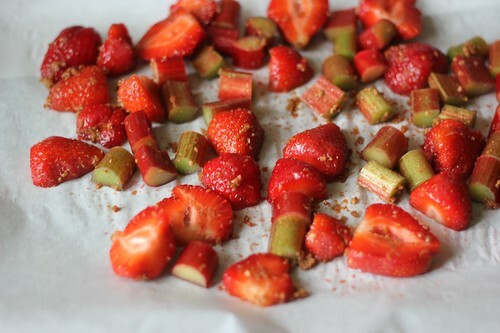 Not wanting the others to go to waste, my heart set on making them into ice cream--after I ate a few, of course. I also had rhubarb and a potted basil plant that just won't quit begging to be added. The roasting idea sprung from my GelOtto Cart visit last spring. And it all came together. I cribbed from this recipe, cutting everything in half, leaving the mixture chunky and adding cocoa nibs during the churn for a little chocolatey crunch. It went fast, and I already have requests for more.